Top-ranked Pakistan swept West Indies 3-0 in their Twenty20 series with another thumping eight-wicket victory in the last match on Tuesday. Pakistan rode Babar Azam’s (51) second successive half-century and Fakhar Zaman’s 40 off 17 balls to reach 154-2 in 16.5 overs. West Indies, batting first for the first time in the series, had earlier scored 153-6 after its captain Jason Mohammed won the toss. “We are trying to play our best cricket and if we continue to play in front of our home crowd, we will only get better and better,” Pakistan captain Sarfraz Ahmed said. Pakistan continued to dominate a weakened West Indies bowling with its opening pair Azam and Zaman putting on 61 runs off only 32 balls. West Indies opener Andre Fletcher earlier scored 52 off 43 balls and Denesh Ramdin provided late acceleration with a robust 42 off just 18 balls which gave the tourists their best total in the series. West Indies lost the first match by a massive 143 runs before losing the second game by 82 runs, when Pakistan posted its highest ever Twenty20 score of 205-5. West Indies put up a much better batting performance on Monday after it was bowled out for its lowest ever Twenty20 score of 60 and then for 123 in the first two matches. “It was good (performance) but not good enough,” West Indies captain Jason Mohammed said. “It’s a young side, including myself, but we enjoyed playing here and will come back again.” Fletcher scored the only half-century of the series for the tourists and shared 72-run second wicket stand off 56 deliveries with Marlon Samuels (31). Pakistan, which rested its frontline fast bowlers Mohammad Amir and Hasan Ali, hit back through Shadab Khan (2-27) in the 12th over as Samuels misread the legspinner’s googly and was clean bowled. Fletcher raised his fifty when he hit Shadab for a six over long off but shortly afterwards got run out as he couldn’t beat the direct throw of Mohammad Nawaz from long off while attempting a quick run. West Indies seemed to be losing its way when it lost three wickets for six runs in later half of the innings to reel at 96-5 before Denesh Ramdin took charge in the last four overs. Ramdin hit four boundaries and three sixes in his quickfire knock that included two successive straight sixes off Usman Shinwari’s last two deliveries of the innings. 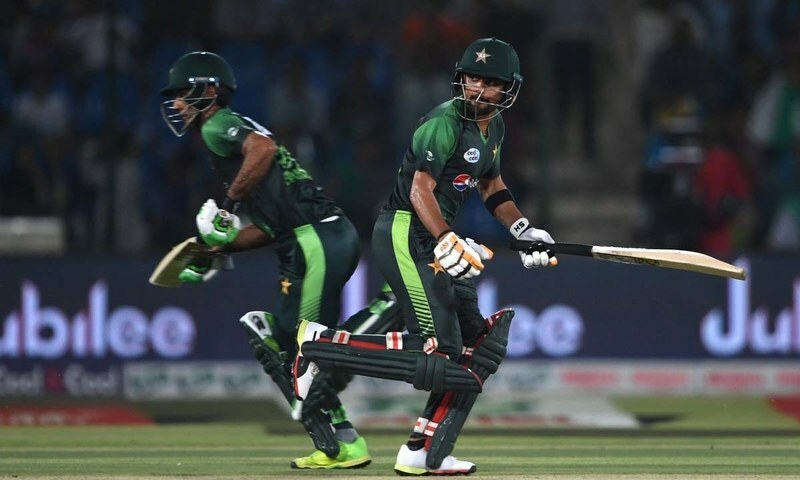 In Pakistan’s roller-coaster run-chase, Zaman utilized the field restrictions in the first six overs, hitting six fours and two sixes before top-edging Ryad Emrit while going for a big shot in the sixth over. Azam combined with another half-century stand with young Hussain Talat stand before getting holed out in the deep. Talat (31 not out) and Asif Ali (25 not out), who both made their international debuts in the series, then completed the rout with more than three overs to spare. It was Pakistan’s seventh successive victory in a Twenty20 series since Ahmed was appointed captain after the World Twenty20 in 2016. West Indies had left out pacer Kesrick Williams to give a Twenty20 cap to spinning batsman 30-year-old Andre McCarthy. Pakistan dropped pace spearheads Mohammad Amir and Hasan Ali to include Usman Shinwari and Shaheen Afridi.